Oh God, will the remakes never stop? But wait a minute, this is not the usual story of Hollywood eating itself and may well rank as the oddest and most unexpected remake of the year. Imagine if you will the Coen Brothers' delicious 1984 debut feature remade by Zhang Yimou, he of Raise the Red Lantern, Heroand House of Flying Daggers fame, with the story transposed from a small town Texas during the 1980s to the Gansu province of feudal era China, and the tone switched from dark neo-noir into a period-set piece that begins as a slapstick farce before evolving into a compelling crime thriller. Seem likely? I thought not. But that's exactly what's happened. The owner of a noodle shop in a small desert town, Wang is a miserable, ill-tempered, money-grabbing boss not averse to short-changing his workers whenever the opportunity arises. His dark moods and abusiveness have driven his wife into an illicit affair with Li, one of his employees, and provoked her into buying a gun believing that only Wang's death can bring her the happiness she desires. Aware of his wife's infidelity and her plans to kill him off, Wang bribes a local patrol officer, Zhang, into murdering the two lovers while providing him with an alibi. But what looks like a perfect plan to Wang soon spirals out of control thanks to an unexpected double-cross that has all the players silently plotting against each other in twist-filled scenario driven by avarice, revenge and murder. 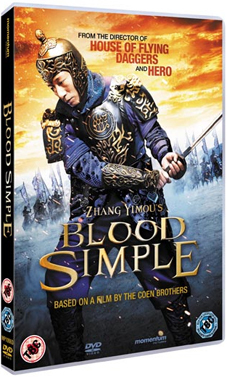 Originally released as A Woman, a Gun and a Noodle Shop (San qiang pai an jing qi), the film is also known as A Simple Noodle Story and The First Gun, Blood Simple will be released on DVD by Momentum Pictures on 18th April 2011 at the RRP of £12.99. No extras have been listed.